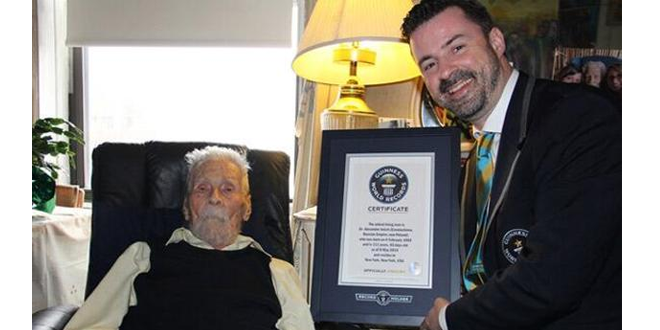 Dr. Alexander Imich of New York has been declared by Guinness Book of World Records as the oldest living man in the world at the age of 111. So what is his secret? How did he live this long? Well, Dr. Imich kind-of shrugged off the question. But he did say that the credits go to his good genes and a healthy living lifestyle. Dr. Imich also shared us his life’s motto, “always pursue what one loves and is passionate about.”, good advice coming from a man who has over a 100 years of experience with life. Robert Young, Senior Gerontology Consultant for Guinness World Records, was the one to verify Imich’s award by utilizing his birth certificate and immigration papers. “He is both the oldest living war veteran and the first ‘oldest living man’ to hold a doctorate,” Young said. Stuart Claxton, an official Guinness Book of World Records official, visited Imich at his Manhattan Upper West Side home to present him with the official plaque. Imich’s record was verified when Arturo Licata of Italy passed away on April 24, 2014 at the age of 111 years and 357 days. The oldest living person, and oldest woman, is Misao Okawa of Osaka, Japan. She was born on March 5, 1898, and is currently 116-years-old. The oldest living documented person by the Guinness Book of World Records was Jeanne Louise Calment of France, who was born on Feb. 21, 1875. She died in a nursing home in Arles, France, on August 4, 1997, at the age of 122 years and 164 days. World's smallest Cow added in Guinness Records! Titanic Violin Found - Up for Sale? Previous: Facebook To Announce Snapchat Competitor?